Three on/off switches located on the back. (1) StudioPRO Octagon Softbox For Use With 5 or 7 Head Fluorescent Sockets, 32"
Bulb Dimensions: 7"x 3"x 3"
The StudioPRO 7 Socket Light Socket is adjustable with (7) seven light outputs. The socket has three switches on the back that let you decide how much light is needed. Since continuous lighting has a "what you see is what you get," aspect is it easy to master professional results right away. Fluorescent lighting is so easy to use, because you simply plug and go! There is absolutely no camera syncing required, therefore it can be used with any camera including Canon, Nikon, Sony, Pentax, Olympus, etc. This 7 Socket Light packs so much wattage and control into one convenient head. StudioPRO fluorescent lamps also convert electricity more efficiently than an incandescent lamp, or household bulb, which means you get about (5) five times more light for the same amount of electricity! Our StudioPRO 45 Watt (45W) Cool Daylight Fluorescent Photography Video CFL Light Bulbs deliver true and crisp color with a Color Rendering Index (CRI) of 90. Meaning, they will render your muslin or paper backdrop or background color accurately to camera with the right white balance setting. They are daylight balanced, also known as white balanced, at 5500K Kelvin that makes them easy to be combined with ambient window light. StudioPRO Fluorescent Photography Video Light bulbs are rated to last up to 5+ years at 4+ hours of usage per day. They remain cool to the touch at 90% less heat than incandescent photography bulbs, which makes them great for multiple applications and will reduce your electrical cost. These professional studio lights are based on new technology and produce ultra soft light without harsh shadows. Use your continuous lighting equipment for portraits, videos, food photography, or even as a grow light for indoor plants. StudioPRO fluorescent Photography Video Light bulbs convert electricity more efficiently that an incandescent lamp, or household bulb, which means you get about (5) times more light for the same amount of energy. An octagon softbox will create round highlights on reflective objects as well as round shaped catch lights in a subject's eyes in a portrait. An octagon shaped softbox is often used to mimic sunlight. The larger the softbox, in relation to the subject, the softer the light becomes. 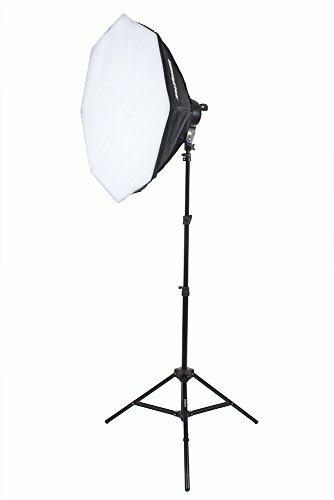 This StudioPRO 7'6" Black Light Stand is one of the most economical light stands available. It extends to a maximum height of 7'6", and has a 5/8" stud top with a 1/4"-20 thread. Our 7'6" light stand with standard 5/8" stem mount that can mount any of our photography or video light heads. They are adjustable form 2'3" to the full extention of 7'6". They have easy to lock knobs for height adjustment. Made of die cast aluminum construction these stands are sturdy while still being light weight at 2.5 pounds each.